The ancient medicinal system of Ayurveda has been around for thousands of years, and has been gaining a lot more popularity in the west. One of the main elements that drew me to Ayurveda is the focus on using dietary protocols and food combinations to address constitutional imbalances. High smoke point – Offering higher stability when cooking due to its smoke point being nearly 500 F.
If Grass fed a Source of Vitamins A, D, E ,K and Omega 3. The fat content of ghee helps absorb fat soluble vitamins as well. Detoxifies deep body tissues and improves skin health. Sounds amazing right? aren’t you glad you bought that jar of Ayurvedic ghee? Well here’s the thing, if you bought your ghee in a store in North America, unless it specifically states, then you more than likely have purchased clarified butter. Now most of you are probably thinking at this point, aren’t they the same thing? As per Ayurveda, they are not at all. 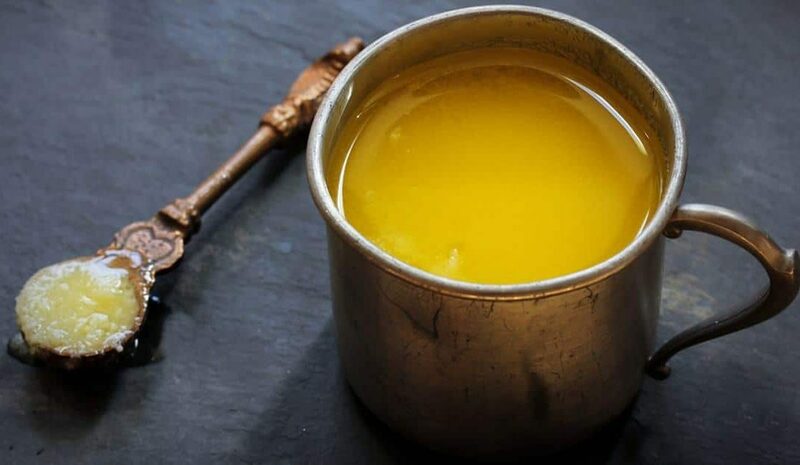 In fact Clarified Butter is considered Tamasic and it was said that even Lord Shiva was said to fall ill from eating it. True healing Ghrita is prepared differently, as I will out line below. Clarified Butter – Produced by taking sticks of butter (doesn’t matter if its grass fed) and heating it in a pot over low heat and skimming as much milk solids as possible , leaving behind the butter oil. This is a shelf stable product and is no doubt delicious, but is void of the physical and spiritual healing qualities s Ayurveda speaks of. This is a Tamasic Food. Ghrita (Ghee) – Raw milk is obtained and boiled, then yogurt is added once it cools down to a certain temperature. Leave overnight in a warm place until it all ferments to Yogurt (Curd). The Curd is then churned and a tangy cultured butter is then formed from the fats. The liquid is drained and consumed as butter milk. The cultured butter is then slowly heated over low heat in a pan and the milk solids are then removed in the same way as clarified butter. The end result is a Tridoshic & Sattvic healing food that is incredibly healing for the body. It even tastes so much better due to its slightly bitter / sour taste. So there you have it folks, due to lack of regulation and education , this critical piece of info has slipped through the cracks. I see a lot of people buying western clarified butter and eating huge amounts of it thinking they are doing their body good. Its not the same thing friends!. Also, keep in mind even with real ghrita moderation is key. As far as I know there are no brands in Canada that offer authentic ayurvedic ghrita from real grass fed milk. Literally every thing you see on the shelves that’s claiming to be Ayurvedic ghee, is not. I either make it myself or import it occasionally (if I get too busy) from a trusted ayurvedic clinic in India where the cows are treated with incredible respect. The Ghee example showcases the importance of preserving old way / slow methods of producing certain foods. The shortcut of simply clarifying butter sticks is not the same. This example can be seen in other foods too such as moving from traditionally fermented sourdough grains to quick rise loaves with isolated yeasts. There seems to be an interesting correlation between our “fast track” foods and disease. Certainly something I will touch up on in a future post. Thank you for this write up. It makes me sigh and say boooo but also yay to know the deeper information as I have been consuming a lot of ghee. Anyone importing the same produt as you from India and having it sent to Vancouver? no one i know , sorry!